The C700 by NordicTrack is one of those machines that integrate the latest workout technology with a low price to bring to the market an affordable and a highly reliable treadmill. The C700 Treadmill is one of the newer models introduced after NordicTrack’s previous C series of treadmills. It is a budget friendly, entry level treadmill that will not burn a hole through your pocket. In this article, we explore the enumerable plethora of features it has to offer that will best assist you in embracing those fitness goals of yours. The NordicTrack C700 Treadmill has dimensions amounting to 78.3 inches of length, 35.75 inches of width, and 56 inches of height respectively. The machine has a space saving design which means that the C700 is compact and won’t take up too much space in your room.� It also has a folding option allowing you to pack up the treadmill and wheel it away when not in use. It has a running surface measuring at 55 inches length and 20 inches width which is nice and compact while also wide enough to accommodate people who want to stretch their strides. The NordicTrack C700 Treadmill has a Multi Window LCD display that allows you to keep track of your entire workout progress with one gaze. The display track elapsed time, total speed, distance covered, and number of calories burned. It also has a scan mode allowing the readings to repeat without you having to manually press the button thus helping you keep track of the progress. It has speeds ranging from 0 kmh all the way up to 10 kmh which can be increased or decreased using the + and – buttons on the control panel. The treadmill also has the sophisticated feature of pulse grip monitors that sense your pulse and use it to determine your heart rate, giving you an accurate or close to accurate tracking of your heartbeat and subsequent burning of calories. One of this treadmill’s best features is its 20 pre-set workout programs designed under the guidelines of fitness trainers. These programs have already been fed into the treadmill’s programming and will provide you with diverse workout modes. These programs include speed, calorie, speed, and manual workouts. Along with the programs is the brilliant iFit mode, a program that allows you to go online and use the endless plethora of workout features available on the internet. You can subscribe to the iFit app using a smartphone or a computer. You can then sync the app up with Google Maps and compete with other iFit users along the globe as well as join fitness communities. You can also get tailor-made workouts designated by fitness workers at any time of the day at any place. iFit offers standard workout downloads, immersive Google StreetView workouts, hundreds of high-definition video workouts, virtual treadmill races and other benefits. A subscription costs $9.99/month. The C 700 Treadmill is equipped with an InterMix Acoustics 2.0 sound system, which is a set of 2″ speakers designed to playing MP3s. The port is also compatible with iPods. A safety key on the panel can be clipped to your clothes which will automatically shut off the treadmill every time the clip is detached. 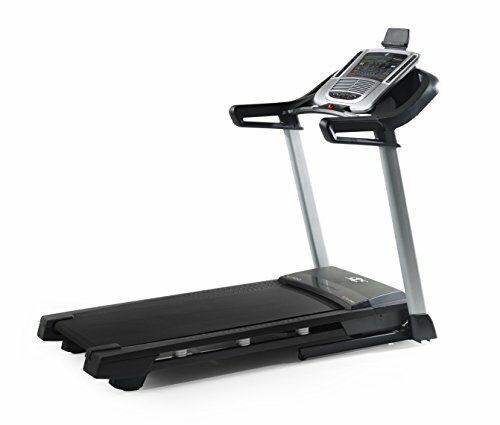 The NordicTrack C700 Treadmill is solidly built and made of heavy duty steel. It weighs 22 pounds and comes with a weight capacity of 300 pounds which makes this a great machine for people of varying body and weight types. It is also equipped with a 2.75 HP motor which is best suited for brisk walk exercises if not for full on intense running. The decent size of the motor means that it won’t be noisy and will thus allow you to listen to background music in comfort and not risk annoying others in the house. It also features the ability to adjust incline from the settings on the control panel. With the touch of a button, you can quickly adjust your incline anywhere from 0 percent to 10 percent to change your workout intensity and target specific muscle groups. When training with Google Maps, iFit Coach automatically adjusts the incline to simulate the terrain. The C700 Treadmill also features a fancy, high-end cushioning deck technology called the FlexSelect. The technology introduces two aspects to your workout. One half-turn activates the double cushioning isolators to help reduce impact on your knees and ankles. Another half-turn offers a firm, stable surface that feels like running on the road. The shock absorption surface is designed to absorb the impact of your strides and ensures that your knees, ankles, and legs don’t feel sore after a workout. The road surface feature gives you a much harder and intense session where all your joints and muscles will be stretched towards their physical limits. Having thus seen all the aforementioned features, let us weigh the pros and cons. The 10 mph isn’t too top a speed to accommodate athletes or those looking for intense running workouts. The NordicTrack C 700 is predominantly a walker’s machine and not the primary choice for runners. The motor has a lifetime warranty of 25 years. Most other treadmills offer a lifetime warranty. It is uncommon to have a treadmill that offers cutting edge features for affordable prices yet the NordicTrack C700 manages to accomplish that feat. Even though this does end up being of a treadmill more for walking purposes, but most looking to use this for more intense work outs will also benefit from the endless features that the machine provides. The iFit is a significant highlight as is the FlexSelect technology. If you are serious about achieving your fitness goals then this is an excellent machine and we strongly recommend it. The C700 is a decent machine to own with a wide number of workout programs, connectivity to Google Maps, and a high quality cushioning technology.